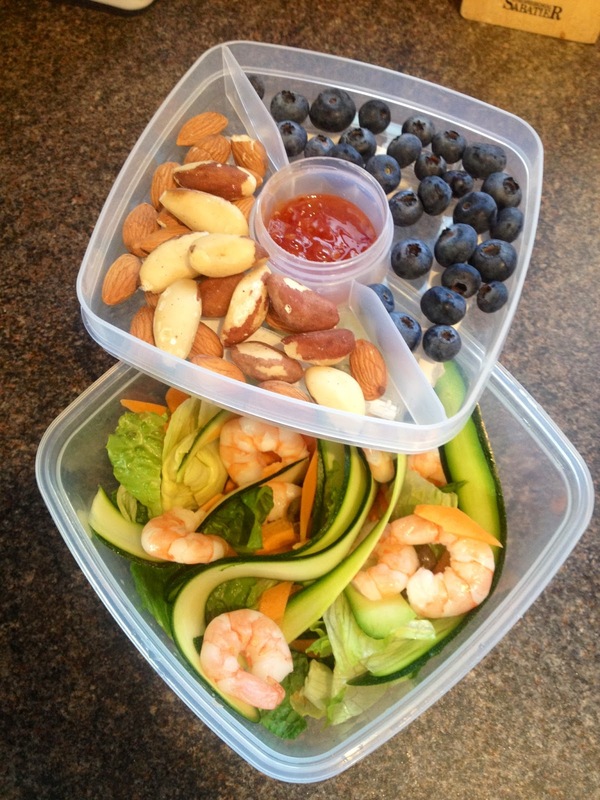 For the last week or two I seem to be loving a bit of seafood in my lunch boxes, so we’re moving from crab to prawns. It’s really easy to get repetitive and therefore bored, so when you are using similar ingredients, try to mix it up a bit with different veg and salad and different dressings to change the flavour of the whole thing. My crab salad was creamy with mayo and avocado, so I’m going down a different route with the prawns and giving them a bit of a kick with a sweet chilli dressing. If possible it’s always a good idea to keep dressings separate until you’re actually ready to eat, otherwise the salad that’s been lugged to work in your handbag and been sitting in the fridge since last night can wilt and go a bit soggy. I got this really handy lunchbox on Amazon, it’s great for keeping dressings separate and also has separate compartments for snacks and nibbles. I also bought the breakfast pot from the same range which is really handy for transporting fruit and yoghurt to have in the mornings.